Amtrak’s Office of the Inspector General released a report today recommending ways that the national passenger carrier could improve safety, better manage costs and increase revenue associated with the haulage of privately-owned railcars. A key takeway is that, just as Amtrak’s flawed accounting system (see Bob Johnston’s report in the January 2019 issue of Trains or this August 2018 Rail Passengers Association paper) keeps it from knowing the actual costs or profit/loss of its passenger services, the company is also in the dark when it comes to the true direct or allocated costs associated with accommodating private railcars (or PVs, for ‘private varnish’). Enjoying the open rear platform of business car NYC-3 Portland behind southbound Adirondack train 68, paused on a siding by Lake Champlain in upstate New York while the train's northbound counterpart passes. All photos by Malcolm Kenton. The OIG’s recommendations are generally sensible, but the report and the discussion so far around it miss many key points about what the private railcar hobby is, how it benefits Americans, and how policy changes that Amtrak implemented last year have constricted PV owners’ travel options to the point where many are selling their railcars (mostly to tourist and excursion railroads) and exiting the business. There are a handful of PV owners who fit the common stereotype of wealthy folks who take themselves, family and friends, or business partners and clients, on lavish trips. The majority, however, sell space on their cars on various itineraries, from short day trips to multi-night journeys, to anyone willing and able to pay a set price, usually enough to cover the traveler’s share of the operational costs imposed by Amtrak plus a share of the use and maintenance of the car, sometimes with a little added on as profit for the owner(s). For many PV owners, maintaining a piece of American history and a pleasant vehicle for experiencing the wonders of our continent is a labor of love. Most are not in the business to make a lot of money. Rather, they seek to offer people a quality of experience not offered on ordinary common-carrier passenger trains. Beneficiaries include not just those who are able to travel on private cars, but also those trackside who enjoy watching and learning the histories of these cars, and those who are able to experience them only briefly on static displays and tours during events. One of Amtrak’s most significant policy changes last year is one that foreclosed one of the major draws of the PV hobby for owners, travelers and railfans — the refusal to operate most charter and special trains, particularly those involving routings not normally traversed by passenger trains. 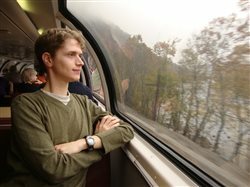 The chance to enjoy a unique journey through uncommon scenery on a train composed entirely, or nearly so, of private cars of every type, paint scheme and background is one that a number of people would save up and pay top dollar for. Now, such an opportunity may never again be available. Private lounge car Adirondack Club prepares to depart Washington Union Station behind Chicago-bound Cardinal train 51. Amtrak maintained that accommodating charter trips was an “operational distraction” that took resources away from serving its core mission of running regularly scheduled trains safely and reliably without bringing in significant revenue. But as today’s OIG report indicates, it is doubtful that the company had a clear idea of what it actually cost to provide locomotives, crews and track access for charter trips and of whether the fees charged to charter organizers were sufficient to recover these costs. While Amtrak has work to do to get a more useful measurement and allocation of its costs and revenues associated with charters and PV haulage, it is equally important to consider the benefits side of the equation — much of which cannot be measured in dollars and cents. Excursions like West Virginia’s New River Train, which consisted mostly of PVs, bring in people who might not otherwise consider train travel in parts of the country where train service is limited and introduce them to its pleasures while connecting them with its grand history. Each successfully marketed charter trip exposed new audiences to passenger trains, perhaps whetting their appetite for regular train service to be expanded. Charter trips can also be catered to any number of groups of people with common interests, allowing trains to serve as mobile classrooms, coffee shops, conference centers and social clubs. If Amtrak management fails to see these as invaluable conveyors of good will towards its brand, and towards the idea of passenger trains in general, then they are missing the big picture. Perhaps an honest reassessment of the situation in light of the clearer picture of the facts that will emerge once management has heeded the OIG’s advice on accounting will lead ‘America’s Railroad’ to reconsider how its policies impact a community that delivers a public relations benefit to all who want passenger trains to be a bigger part of Americans’ lives in the future while preserving and learning from its past. Disclaimer: Malcolm Kenton is a freelance contributor to Trains and an independent consultant specializing in writing, research and communications with a focus on passenger rail and transit. His clients include Herzog Transit Services, Inc. and the Association of Independent Passenger Rail Operators, as well as a travel agency that organizes and manages charter train trips in the US. He is also an avid and frequent train traveler. The views expressed in Observation Tower are solely his own and do not necessarily reflect the positions or business interests of any of his clients.